Dr. Furness learned "Carrying Money" from a boy in the Island of Uap, Western Carolines, in 1902. The native name is Runi-ka-fei. First: Form the figure of "Ten Men." Second: Rest the figure on your lap and slip each thumb out of its loop, and then pick up from below on the back of the thumb, close to the index finger, the string which passed from the thumb to the index (Fig. 358). Gently withdraw each middle finger from its loop, and let the string which passes over each index and thumb slip off the index, and draw the hands apart with the strings on the thumbs and index fingers until the central figure is about two inches in diameter (Fig. 359). Now withdraw the thumbs and index fingers, and let the figure lie fiat on the lap, or a table, with the four loops radiating from the central circle. Third: Without disturbing the figure, pick up with the left thumb and index the far string of the right near loop about two inches from the central figure, and pick up with the right thumb and index the same string about two inches farther to the right; and form a small, flat circle in the string by passing the string held by the right thumb and index under the string held by the left thumb and index; the point where the strings cross should be toward you. Lay the ring down, and with the left thumb and index pick up the end 0f the right far loop and, without twisting the strings, thread the whole loop from below through the small circle formed on the far string of the right near loop and put the far loop back into its former place. With the left thumb and index pick up the near string of the right far loop about two inches to the right of the ring through which it has just been threaded, and with the right thumb and index pick up the same string about two inches farther on to the right; in the same way as before, make a similar circle in this string by passing the string held by the right thumb and index wer the string held by the left thumb and index; in this circle the cross of the strings should be away from you. Pick up with the left thumb and index the right near loop, and, without twisting the strings, thread the whole loop from above and away from you through the circle just formed in the near string of the right far loop, and put it back in its place on your lap. 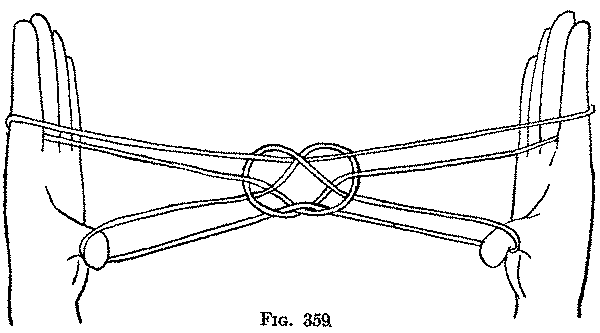 In the same manner put a similar loop on the far string of the left near loop and thread the left far loop through it; and put a similar loop on the near string of the left far loop, and thread the near loop through it (Fig. 360). The central figure represents a piece of Caroline Islands Money—a large circular slab of stone—and the four little circles are the natives who are carrying the money on a pole passing through the middle of the slab. This is the only example I am able to give of a final figure which is made by taking the loops from the fingers and then arranging the strings, as it were, artificially. As this particular figure was shown to Dr. Furness by a young boy, one might reasonably suspect that there is another way of doing it which he did not know; but I have seen an Eskimo make a figure in a similar manner and it is possible that the finished figures (which I give farther on) from the Nauru, or Pleasant, Island of the Marshall Islands, were, to some extent, made artificially. Obviously, figures formed in this way are less interesting than those developed entirely on the hands. The figure produced by the Second movement (Fig. 359) occurs among the finished patterns from Australia given by Roth (pl. x, Fig. 1) see page 383; and Edge-Partington figures (pl. 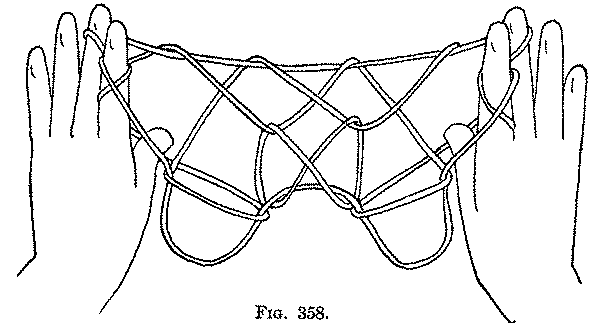 341, 1) a similar pattern from Torres Straits, preserved in the British Museum (A. C. Haddon Collection) entitled "cat's-cradle in the form of a mouth (good)." As this simple pattern can be produced by several entirely different methods, it probably will be found to be very widely distributed.